The Dwarf Blue Leg Hermit Crab or simply Blue Leg Hermit Crab, has blue legs with red banding. Both claws are of equal size, and members of this genus are sometimes called "Equal-handed Hermit Crabs." This tiny crab lives in abandoned snail shells, or it may attack and eat the snail, then use the shell for its home. 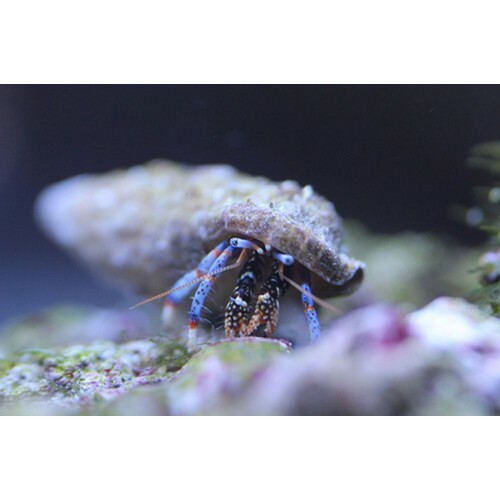 The Dwarf Blue Leg Hermit Crab is a valuable addition to an aquarium because it will eat algae including green hair algae and cyanobacteria. In addition, it provides valuable aeration by sifting through the sand. It is one of the Hermit Crabs that is reef-safe. If insufficient algae is present, the Dwarf Blue Leg Hermit Crab will need to be fed dried seaweed.